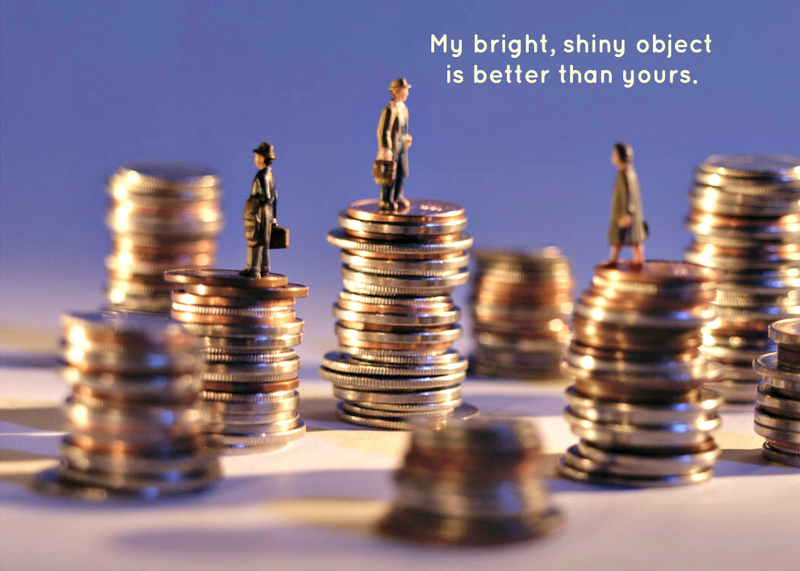 The Myrland Marketing Minute Blog Goals, Bright Shiny Objects or Competitors? Goals, Bright Shiny Objects or Competitors? Let’s face it. Many of us are easily distracted by the next bright, shiny object that is flashed before our faces that holds promise for our practice. We see a new networking event that promises to expose us to 100 General Counsel all at once! We are presented with an opportunity to put our name in the new Mega Lawyers directory. We see an online course that promises to cut down the amount of time it takes to market. We are offered the opportunity to present at the Grand Pooba conference that is making its way around the nation. Why are these so attractive? Many reasons…do any of these sound familiar? What I’m doing doesn’t seem to be bringing in enough business fast enough. It’s inexpensive, by-golly, so I won’t be out much if it doesn’t work! Attending the same old Business After Hours doesn’t seem to bring in new clients, so I’ll try another. My referral sources are lousy. I have the chance to start all over, and will feel better about myself if this one is a success. Well, my competitors are doing it, so I have to try it, too. Hold on. Wait just a minute. Let’s rewind about 3 seconds to that last bullet point. I’m not letting you out of here with that one again. No, I’m not. You’re not leaving here until we have a little talk. Don’t worry, this won’t take long. That is precisely the point I am trying to share with you today. What clients do I want to work with? What kind of work do I want to do for my clients? How am I going to get to know these clients? What am I going to say to these clients when I find them? How am I going to nurture the relationship I have with them? This has very little to do with the next shiny object or opportunity that comes your way. If you know the answers to the 7 points above, then you will be able to either ignore or take advantage of bright, shiny marketing objects that come your way because they will either fit in to your plan, or they won’t…period. The answers to those 7 points will have very little to do with your competitors. They are your answers, not theirs. This is your plan, not theirs. You won’t always have to be looking in your rear view mirror to see what they are doing, and to then make sure you are doing it, too. You will be doing what you know you need to do to for your practice. Advance your own vision, not reacting to your competition. Your Choice, Business Or Hobby?